I don’t know what the temperature was on Saturday morning, but it sure felt like 55 degrees compared to the weekend before. My sister and her husband were visiting from Colorado. 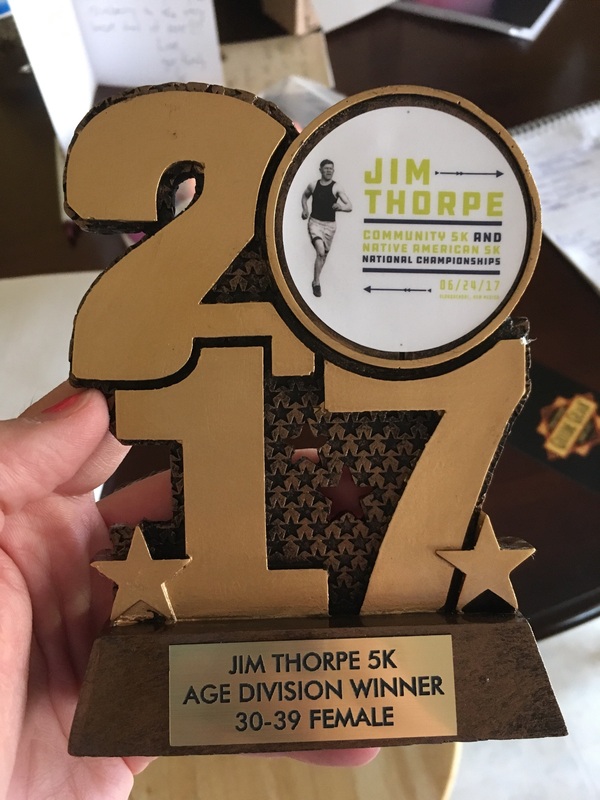 Among other reasons for visiting, my sis had her eye on running the Jim Thorpe 5k. I had never heard of it. However, based on my survival of the Cherry Garcia 5k, knowing the course, and knowing that the weather would likely be cooler than the Cherry Garcia, I decided to run it as well. Her plan was basically to race the thing and see what she could do. My plan was to trot along like a cheerful turtle. We got to the race site with a comfortable cushion of time before the start. We picked up our packets, used the facilities (which I would do another approximately 8 times that morning), and strolled around a little. The weather was indeed cooler (thank you God and runner guardian angels!!) with just a hint of a pleasant breeze. We’re talking summer racing bliss here. There was a good turnout, and the relaxed, happy atmosphere of a well-organized community event. Runners who would vie for the win jittered about, but there were plenty of families, too. The 5k was the longest race of the morning — somewhat unusual these days, and kind of refreshing. The time came to arrange ourselves at the starting line, so I aimed for somewhere around the middle (have I mentioned yet how PHENOMENAL it feels to line up free of anxiety?). We ran a two-loop course with plenty of turns, but no hills. I’d call that fair. The organizers had prepared for a potentially hot morning by providing two water stations, so no one went thirsty. I ran my first mile at roughly the same pace as last week’s race. But with conditions being better, I figured I’d try to stretch my legs a little during the last two miles. The end result: 26:12, a minute faster than last week, and a pregnancy PR for 5k! Woohoo!! My sister was also satisfied with her [fabulous] time, which was in the 21:50s. We debated hanging out for the awards ceremony, but the next two events kept us there. Who wouldn’t want to watch a kids’ kilometer race, followed by (!) a 300-meter toddler race?? The toddlers were, as you can guess, particularly entertaining, and adorable. Some of them even managed to stay on the course! After we cheered them all across the finish line, it was time for the awards ceremony. We weren’t sure if we had won anything (the results hadn’t been posted in the usual fashion), but we figured we’d go and see. Another big plus for this race: the awards ceremony was INDOORS. WITH AIR-CONDITIONING. Seriously. I may need to run this race more often. And what do you know? It was a good thing we stuck around for the awards, because my sis finished 2nd in her age group, and I won mine! Wonders never cease. Maybe I should channel that cheerful turtle more often. Very impressive! Congrats to you both!